Just last week, I asked participants in one of my communications workshops what they learned that day that surprised them. "The idea that I should start with what the audience might want to know, or what they already understand, instead of starting with what I want to say," said one woman. Yesterday, on Twitter, another speaker -- this one at the HighEdWeb conference for higher education web professionals -- learned the same lesson, but the hard way: Live, in real time, from the audience. And because the audience decided to deliver the message via a backchannel discussion on Twitter, the rest of us had the chance to follow along. What happened? People at the conference report it started with a near-invisible slide with yellow text on a white background, but the speaker's credibility took many hits due to his content and comments, most of which seemed outdated and out-of-touch to this social-media-savvy community. He's not on Twitter and wasn't following the backchannel discussion. 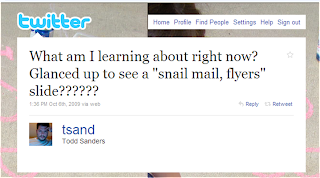 His emphasis on snail-mail marketing techniques also hit a nerve. Once the piling-on began, people outside the conference chimed in, escalating it to a trending topic on Twitter--one that dominates the day's discussion. Know--or get to know--your audience. For me, this always has been the starting point for any communication, in any format. The Eloquent Woman blog offers 5 ways to find out about your audience, and Twitter's an excellent resource if you're speaking to a social-media-savvy audience. (This conference also had its own online community that speakers could consult.) But you can't go wrong with asking and listening, in addition to research. Find out what their expectations are--and check your assumptions at the door. Speakers must add value. No one has to listen to you and everyone has other distractions--or can make some, if bored. Are you helping them learn? Think through issues? Strategize? A focused group like the one in this case comes to conferences for professional development, and if nothing develops from your comments, a revolt might. Think of technology as respect for the audience. That white slide with yellow lettering got the ball rolling--and to this audience, it signaled, "Watch out, if this is what we're in for." And while speakers may think of technology as something they can ignore, audiences see it as enabling a respect for your listeners. Can they hear you? Can they read your slides? Can they see you and what you're showing them? Are you leaving one slide up too long? All basic, and all essential. Learn to read when you're losing the audience. One tweet from yesterday's debacle noted that most of the audience's faces were lit by their smartphones as they tweeted and texted during the presentation. That's normal these days--but not throughout the entire speech. If you're not engaging them in real life, you need to change course. Check out The Eloquent Woman's tips on what to do when you're losing the audience. And look and listen to your audience while you're speaking. Develop a good ear for those dreaded silences. Listen to yourself before your speech. Audio- or video-recording, easy enough to do on your own, can help you learn which words you repeat. In this case, fillers like "actually" serve as a slightly longer version of "um." Like "um," if your audience is bored and hears any word too much, they'll start counting. 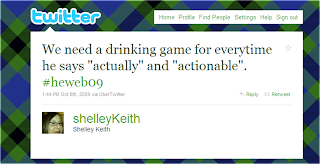 Are you overusing other words, like "actionable" in this case? Find alternatives so your presentation holds the reader's attention better. Connect with the audience or it will connect elsewhere. Whether it's asking questions at the start of your talk, involving volunteers to make a point, or sharing examples from people you know will be in the audience, you need to make sure you're not talking over or at them, but with them. In this case, the connection was so unattainable that this tweet suggesting an "I survived..." t-shirt was met, minutes later, with a real t-shirt available for purchase. Don't wait till it goes this far to engage your audience. You may see a horror story in this, but, as a speaker coach and trainer, let me urge you to use this backchannel--and more like it--as another form of preparation. The only way to stop this type of audience dissatisfaction, in the end, is for speakers to learn how to avoid it in the first place. Learning what today's audiences want and appreciate, as well as what makes them skeptical and cranky, should be on your list of presentation skills. Want to see the presentation? One participant used his webcam to capture it here. Denise, great comments, although I do suspect the speaker was in over his head (blame the organizing committee for not vetting him). Also, a new tool, Need4Feed, may have turned up the volume. It was launched at that conference. Interesting post, but it would be very helpful if you could link to the tweets/Twitter accounts in question as well as the relevant hashtag in Twitter search. Steve, I agree--organizing committees can do more and often these sessions are lined up much too far in advance. But then all parties, especially the speaker, should stay updated! And Ian, I've added the links you suggesst. Blog in haste, correct at leisure...many thanks! 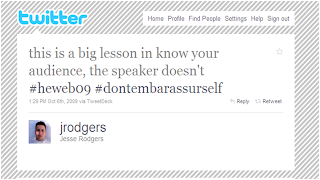 Twitter is evil and rude - have we all forgotten the rules of basic respect? Does legitimizing audience criticisms make the substance of the presentation any less meaningful? Not really. Ian, the link is there at the top. (maybe she just jumped in and changed it, but not likely) Also, as with any # tag, you can just enter it in search and *boom* there it is. Well, there ya' go - if I'd have waited 15 seconds, I'd has seen Denise's comment on adding the link. I've just watched the ustream of part of the presentation. There was only one question from the audience? Why didn't those tweeting so much annoyance challenge the presenter in the room and give them a chance to respond? Denise, thanks for the post. I just wanted to add that as an audience, we might want to consider if twittering negative feedback using an official conference hashtag is appropriate professional conduct, even if the speaker is in over their head. We're still dealing with a person here, and a public humiliation behind their back isn't very respectful, even if you think they didn't respect your time by adequate preparation. It's not out of the question that this conduct could have legal ramifications if the speaker feels wronged. Presumably the audience is attending the conference at the expense of their employer and I'm not sure it reflects positively on those organizations to have their representatives publicly insulting people. It seems small. There's a takeaway for the audience too. 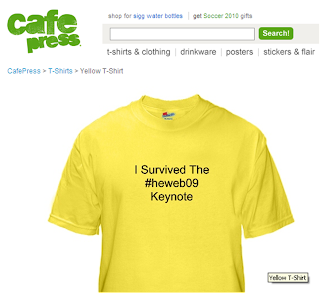 Denise, I've added your post as a link to my own post about the #heweb09 keynote -- and the lessons it offers for anyone who sees a presentation as one way. This is the tweet stream for that day; the keynote runs from roughly noon to 1 p.m. (some 550 tweets). I'm delighted to have such close and thoughtful readers, and have added links to related posts that touch on some of the points you've made--including the debate over whether this is polite and should be allowed at meetings. I agree that there are takeaways for the audience and for organizers--I'll leave those for others to discuss, because my expertise lies in preparing speakers. But I'll say this: While the audience members could indeed have asked questions, when a speaker turns off an audience, she can turn them all the way off--to the point where they don't wish to try. (Though in this setting, that'd be one popular questioner with the rest of the crowd.) Speakers hold a lot of perceived power: They have the floor, as we like to say, and that's a responsibility they need to take seriously, in my view. Just got back from this conference. Gotta say, the audience was nothing but a bunch of asses who think they are better than everyone else. One thing is for sure, I'll never attend another HighEdWeb. It's just a big clique of wannabe 'web rockstars'. Too much ego stroking within the twitter crowd for me. Some of the worst presentations were from others on twitter, but they got nothing but praise from their peers. Interesting to watch what happened when someone not on twitter and not within the group hit the stage. So glad to be home. As an attendee at this presentation, I wanted to give our perspective. This speaker was offensive. Let's just put aside, for a moment, that his slide deck was awful - not everyone is a designer and that can be excused if the content of the presentation is credible. But the content of this presentation was circa 2005 at best. Here was the basic gist: "I started this company and it failed and went out of business...but let me tell you about it!". I'll partially blame the conference committee for bringing him in (they should have known better), but ultimately, he accepted the invitation and should have prepared. As a speaker (I presented at this conference and do several others a year), if I come to a technology conference to give a talk about technology, and end up supporting tactics that are several years old and no longer relevant, I would expect this type of backlash. This speaker should have known better. Had he been up to date on his material, he would have known the potential for us to talk to each other during his presentation over Twitter. The first thing I do after doing a presentation is check the backchannel to see what was said about me - if I sucked, I expect that to be posted publicly. It's the way it goes. This type of thing does nothing more than to hold speakers to a higher standard. If you can't live up to it, then don't accept the engagement (and the corresponding speakers fee that comes with it, which ultimately comes out of our pockets as attendees). Finally, someone mentioned that this type of thing makes us look unprofessional - this is a conference where many of us self-fund to be there. I'm out over $1000 personally and I want that money put to good use. And even if my company did pay for it, then I suspect they probably want to get their money's worth too. Thanks for all these comments. I agree that many were snarky rather than substantive--but it sounds as if there was much in this presentation that just didn't sit well with the audience. And people would have said much of this even without Twitter. The difference, of course, is making it public in real time. As to whether things are "unprofessional," it's interesting to note that that term has been used over the decades when new technology threatens to change the way we do business. Check out this post about how telephones (and other things) were seen as "unprofessional," once upon a time! There are lessons to be learned all around. (For what it's worth, I was a participant in the backchannel, a fact of which I'm not particularly proud.) I've gotta confess a fair amount of inner questioning since the conference, the kind that leaves you up at night going through your head to try to sort it out. We've all known that there's an impersonal aspect to electronic communication ever since we first attempted to be sarcastic in an email. Without tone of voice, without facial expression, communication loses a lot. Snark, once it starts, can snowball ... a snarkmob formed during that keynote. There was something in the neighborhood of half- to three-quarters of a millions dollars spent from already-stretched HE budgets to get all 450 of us to the conference. Jared Spool's Monday keynote was well worth it. Spool's non-technical, in the sense that he's not a coder, and that's OK, for day one. Though there were points to disagree with, it was thought-provoking. It set a high bar for the next day's session. But the next day, how about someone who IS technical ... it would have been great to hear from someone about HTML 5, for instance, and the impact it will have on our working lives in the years ahead. I wanted to hear from an Eric Meyer or a Molly Holzschlag or a Jeffrey Zeldman; people who are bestowed with stature in this community because they've earned it. ps. Overall, it was a great conference; many of the presentations left us with ideas and practices we can apply in our work to evolve our websites, and the discussions outside of formal sessions were often amazing, always interesting. I was there too, and despite all the positive takeaways from the conference, I find myself mostly reflecting now on that keynote presentation and the significance of the backchannel revolt. I agree that the speaker was not prepared, and in days prior to Twitter I would expect folks to shuffle in their seats, glance at their watches, then ask tough questions and provide strong feedback during the Q&A. Dialog is much more productive than talking behind someone's back, and no one deserves to be tarred and feathered for giving a bad presentation. As a person who does a lot of presenting myself, I can't help but feel that there's much more at stake now if I stumble. I can no longer dismiss any presentation anxiety I may be feeling by asking myself "What's the worst that could happen?" because I now know that the answer to that question is... well, I could be the subject of worldwide ridicule and have my reputation and career destroyed, all in an hour or less. I do appreciate what you've done here Denise to convert this event into a positive learning experience. Jeffrey Veen also has some good, relevant ideas from a few months ago about working to incorporate the backchannel into the presentation: http://tinyurl.com/68k2dp. And Terrill, I like your thoughts and am grateful to see the link to Jeffrey's very good post--especially when he said he felt as if he were cheating on an exam to see what the audience was thinking in real time. 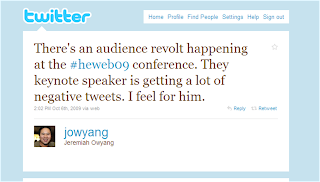 In fact, Twitter may solve for many speakers something they have always wanted to know: What the audience is thinking. Scary, yes, but also useful and often wonderful. I can sense there are more blog posts here for me to write, and welcome your thoughts on what would be useful for me to address. 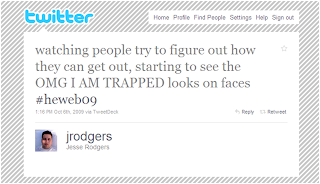 And I am remiss, also in waiting till now to give a great big hat tip to Joe Bonner at Rockefeller University, who was following the #heweb09 stream from afar and flagged it for me as something to cover. I used to say live-tweeting was impolite to the speaker, but this post convinced me that my opinion about manners isn't what counts -- it's the fact that people are going to tweet, regardless! So, I'm adjusting my thinking on this, and will try to look at live-tweeting as an opportunity to refine my message to meet the needs of the audience, when it occurs. But I'd like to know your thoughts on how to do that during a presentation. (I'm assuming that afterwards is effectively too late.) Sometimes the verbal few don't represent the majority -- sometimes they do -- we know that from market research focus groups, jury duty, etc., the most verbal responders tend to represent either end of the tail, not the median. So, would you actually stop mid-stream, take a pause, and say "I'd like to gauge your feelings on (such and so) before moving on. Any comments?" What if no one piped up? What if a lot of people did? To what extent do you "own" your presentation and to what extent are you responsive -- on the fly? What if the tweeters don't represent the views of majority? There is individualism, and there is the needs of the collective. At what point is it considered disruptive? Mary, what a thoughtful comment. I'm pleased if my post changed your perspective. You raise good reminders about the rights of the individual--we do need to keep our freedom of speech in mind--versus those of the group. Your questions really prompt me into a new blog post to answer them properly...I'll start working on it! I welcome more questions and ideas for a post to answer Mary's good questions. I think part of the problem is the divide between the "haves" that are reading the Twitter feed and the "have nots" that are excluded -- most importantly, the presenter themselves. I'm a frequent speaker at conferences, and I've been experimenting with some tools I put together that embed the live Twitter feed directly into the slides I'm showing on the screen. I use a mix of a "ticker bar" at the bottom of each slide, and then feedback slides that show all the latest tweets in a single slide. I'm dazzled by the many facets this incident has had, and the myriad takeaways people find it it. Details in this post, along with links to posts by a couple of people who were there. Timo, thanks for sharing your prototype--helps us all move into a practical solution, as does Dave's analysis of the tweets during this talk. Looking forward to more insights...this incident does prompt a lot of thoughtful observation, when all's said and done. Thanks so much for this post. These are fantastic tips - even outside of avoiding a Twitter maelstrom. Stories like the HighEdWeb conference serve as a cautionary lesson: "Know who you're talking to - and make sure you're interesting". That was relevant and essential before Twitter existed, but clearly even more key now that (as far as I'm concerned) a part your reputation is somewhat on the line with each talk. I've written up my thoughts on people tweeting at conference ("Talk Amongst Yourselves – or Not So Much”)- something I've experienced as a speaker and participant - and that I do (albeit somewhat infrequently).